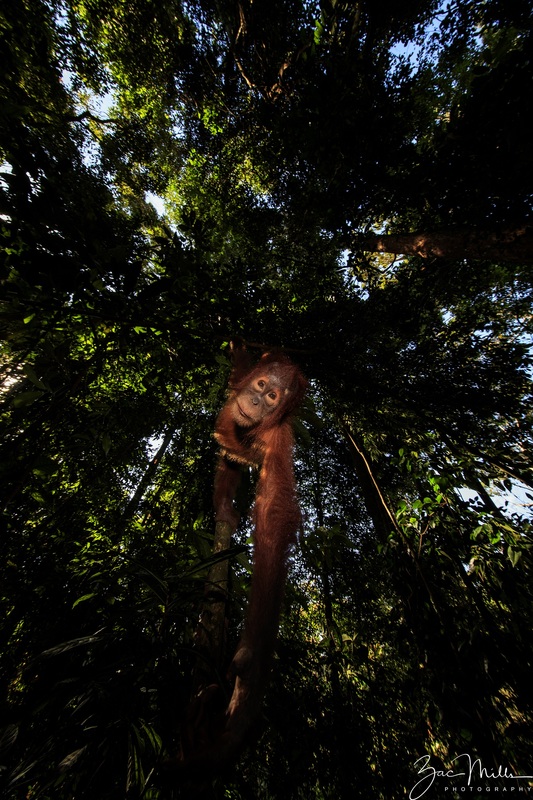 Photographer Zac Mills has been travelling to Sumatra to photograph orangutans and their forest home since 2013. Following his sixth visit this year, he shares his experiences and perspectives. “Henry found Peshak!” With these three words from Darma, my good friend and expert orangutan tracker, we pick up our trekking pace and race towards the spot from where his brother had called out to us. As we get closer, my heartbeat picks up as I’m filled with adrenaline and excitement. We arrive out of breath, perspiring profusely in the hot and humid rainforest environment. But it’s all worth it when we look up to discover my favorite female orangutan staring down at us from with her baby clinging to her side. 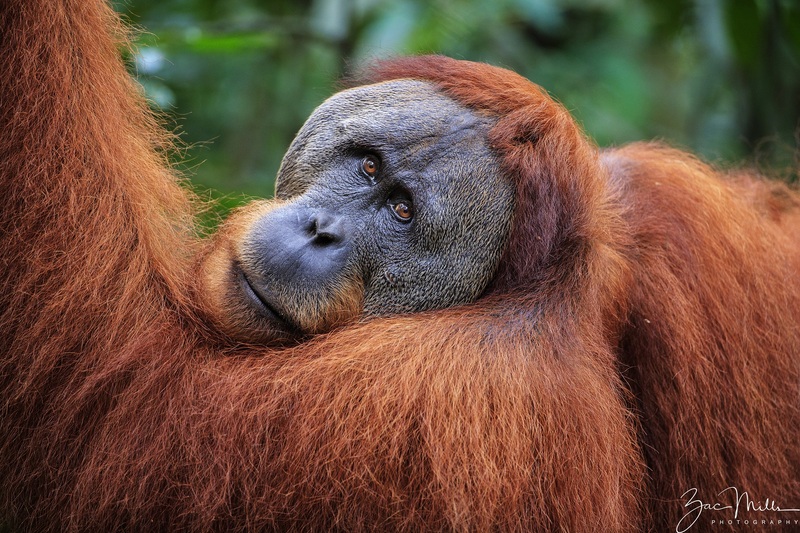 I have a confession to make – I love orangutans. 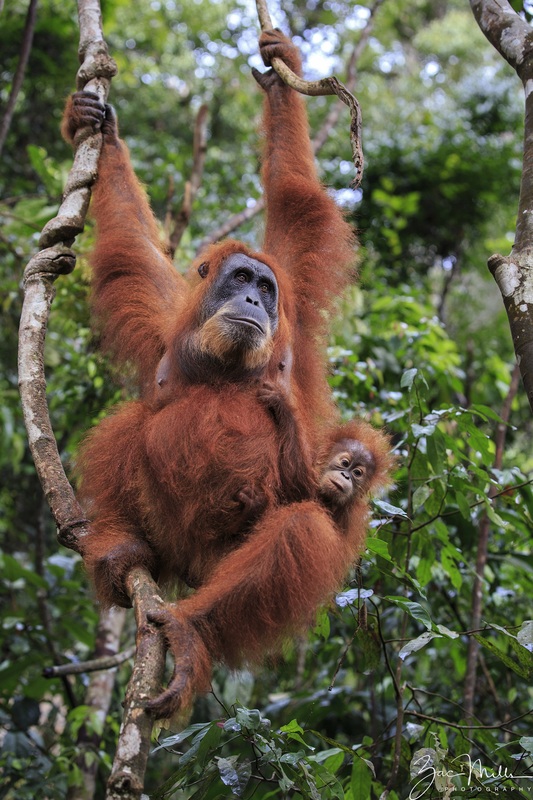 Orangutans are so interesting to watch first-hand as they go about their lives criss-crossing the forest. When I see Peshak, I can feel the love that she has for her baby. Adult males are incredibly impressive. Their sheer size makes them a force to be reckoned with. However, in their solitary explorations through the forest they can also appear to be docile and pensive. Orangutans remind me of humans in so many ways through their intelligence, personalities, and their physical characteristics. 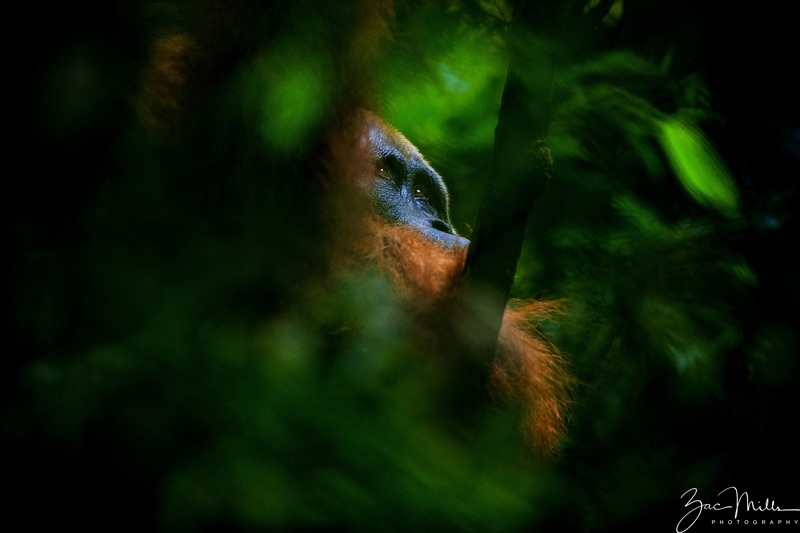 And this is why I return to Sumatra every year to photograph and watch them in their forest home. You may have heard that Gunung Leuser National Park is a place unlike any other on this planet. It is the only place in the world where orangutans, tigers, elephants, rhinos, and leopard cats roam free. In addition to this “big five”, the national park is filled with a great variety and abundance of plant and animal life of all shapes and sizes. While it is much more difficult to see the other big four species, one can observe so much from simply walking through the primary forest. 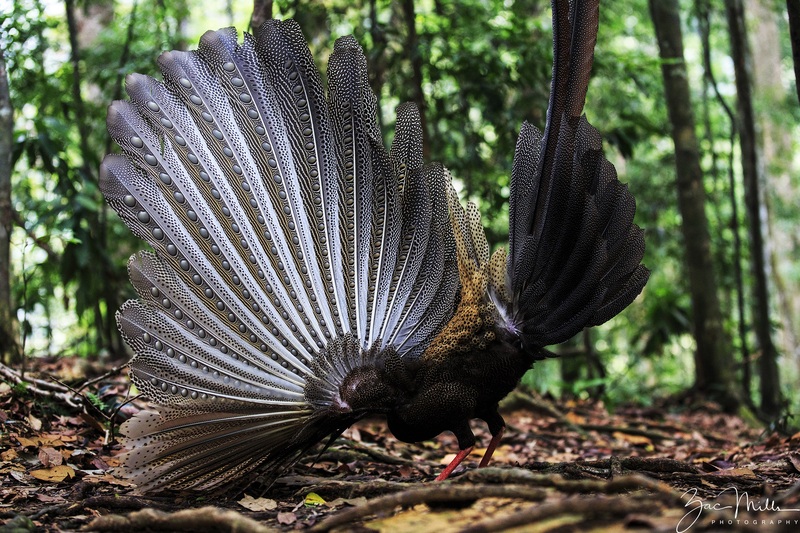 One of my favorite memories, for example, was when a great argus (similar to a peacock) mistook me for a female and revealed its beautiful feathers, which are normally displayed when trying to impress a potential mate. Unfortunately, Sumatran orangutans are facing a severe threat to their existence due to habitat destruction, the illegal pet trade, and conflict with villagers. The latest estimates put their total population at approximately 14,000 and trending in the wrong direction. They are classified as critically endangered by the International Union for the Conservation of Nature. And one only needs to drive to Gunung Leuser National Park to piece together why the orangutan population is decreasing. On the way, there are what appears to be endless rows of palm oil trees in every direction. These vast monoculture oil palm plantations are a stark reminder of the primary rainforest and orangutan habitat that they have replaced. To this day, parts of the primary forest in the national park continue to be cut down due to lax regulations and lack of enforcement by the local government. One experience from two years ago still weighs on me. One morning we found a gaunt and visibly distressed adult male orangutan. Far from being the dominant force I’ve come to expect, this one was weak and could barely move from tree to tree. We found him at the edge of the forest and Darma speculated that he left the park to avoid a physical confrontation with another dominant male. After some time, we noticed that this male had a huge gash on his upper back. We called the park authorities to alert them to the situation and after a long negotiation they agreed to try to give the orangutan some medicine, which was mixed with some fruit and placed halfway up the tree where the orangutan was resting. Unfortunately, the male died a week later. During the examination, the park rangers found gun pellet wounds all over its body and a closer look at the gash revealed that it was likely from the strike of a villager’s machete. This year I visited the Rwandan mountain gorillas in Volcanoes National Park shortly after the orangutans and the difference in the management of the parks could not be more striking. In Rwanda, the guides are professionally accredited and work for the government. There is absolutely no feeding of the mountain gorillas and any behavior that stresses the gorillas is not tolerated. Consequently, the gorillas paid almost no attention to us as they went about their daily life. Furthermore, a fixed portion of the park entrance fee is dedicated to community development projects. This way, the local community benefits from the mountain gorillas and the rate of poaching and habitat destruction has decreased significantly. In contrast, there are many unlicensed guides in Gunung Leuser National and I have observed numerous guides in Gunung Leuser feeding the orangutans so that they will come close for the tourists. Not only does this significantly increase the risk of disease transmission, it also creates an aggressive situation. I’ve seen orangutans violently chasing guides and tourists for food and some orangutans have even learned to grab tourists and not let go until they are fed. 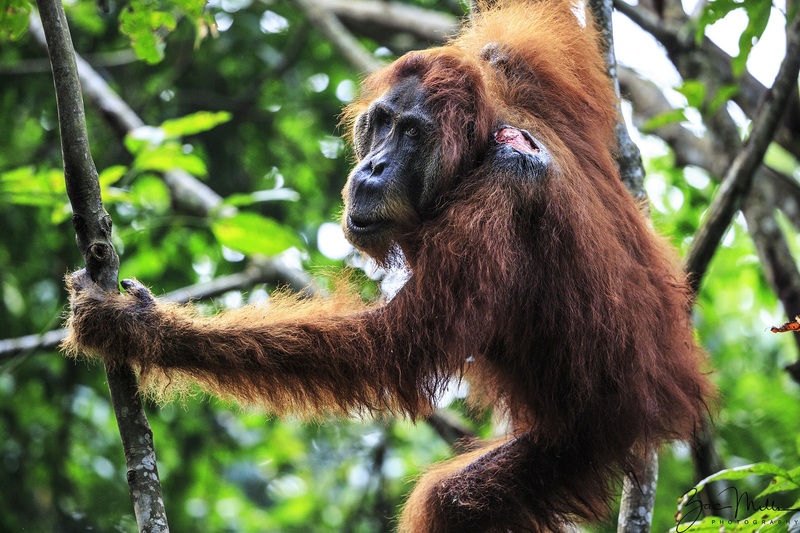 As a result, tourists have been bitten and attacked, and orangutans shift more away from their natural behavior. The Gunung Leuser National Park management could replicate the Rwanda model of directing a proportion of the park entrance fee to the local community too. At the moment, villagers living in the buffer zone and outside of the tourism business receive little benefit and some view orangutans as a menace. 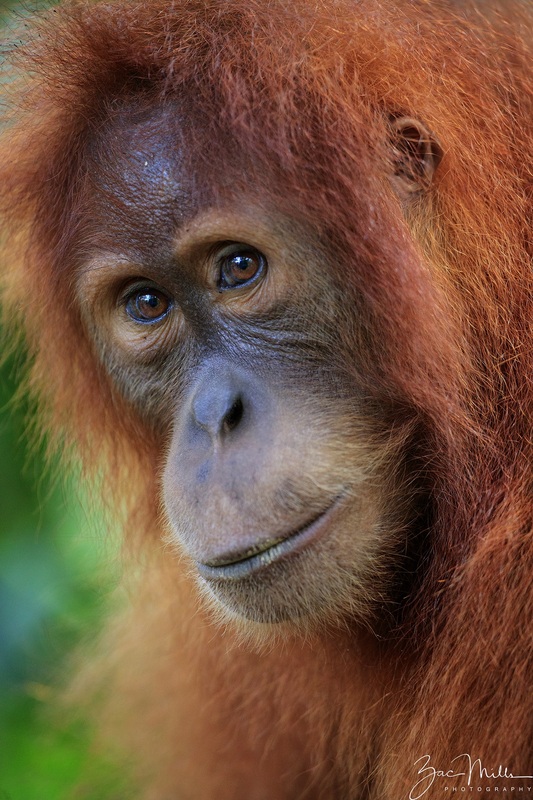 If an orangutan eats fruit from a villager’s fruit tree, then that is a threat to their financial livelihood. This may have been why there were pellet gun and machete wounds on the male that died. I aspire to a world where orangutans are freed from the severe threats to their existence and can go about their lives in peace. This is why it is very important to support the work of SOS and their partner organizations who make a tangible difference by saving orangutans in peril, protecting and rehabilitating the forest, fighting destructive legislation that would allow mining in the park, and working with local communities so that they benefit from the presence of orangutans. Seeing an orangutan in the wild is an incredible and unique experience. Since I first visited Gunung Leuser in 2013, I’ve been back six times and have been stung by bees, attacked by leeches, and had countless mosquito and other unknown bites. Trekking through the hot and humid rainforest is very strenuous and physically demanding. By the end of each trip I am usually physically exhausted. But the memories and insights I have gained into our not so distant relatives will stay with me forever. I can’t wait to go back next year!